The team is great! Friendly, knowledgeable, "can-do" attitude. They were all very friendly and helpful....a pleasure to work with. We have stayed at Pacific Tides several times, and enjoy it each time we stay. 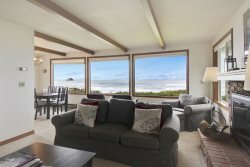 Loved the team with CannonBeach Vacation Rentals. So helpful in finding the right house for us . Thank you, we had a wonderful time. Everyone at Cannon Beach Vacation Rentals was helpful and courteous. I usually have tons of questions and they are always happy to answer them from the 1st to the 10th! We really enjoyed our stay at Beach Bijou. Worked great for the number of guests. Was a bit surprised that you accepted this home into your rental program without insisting that the owners clean and update. Thank you for staying with us and your feedback. Actually the homeowner has been working over the last couple of years to make substantial upgrades to the house. We know that new carpet and bedspreads are on their upgrade list.